Are you looking for practical and significant ways to improve your early childhood program? Dana’s Kids’ Early Childhood Program Consultation services are a result of the last 14 years as an early childhood teacher, program administrator and consultant, special educator, and parent educator. How many times have you seen a child easily use the potty at school, but remain in diapers at home? Or had a parent email or stop you in the hallway to discuss a concern about their child’s behavior outside of school? A strong connection between home environment and parenting skills, and the routines, expectations and potential in school is essential. Dana’s Kids can help your teachers support the individual needs of children, including those with special needs, as well as educate parents about their child’s development and the support they may need. Through parent workshops, 1:1 parent education, individual play-based sessions and facilitated play dates, I can help you create a bridge between home and school that will enhance your relationship with families and help parents and children be successful. Whether focusing on typical development and behavior, or special needs, my parent education workshops create a space for parents to feel supported and empowered. They’ll learn to reflect on what works and what doesn’t, and consider their own growth as a parent and their child’s continuing development. 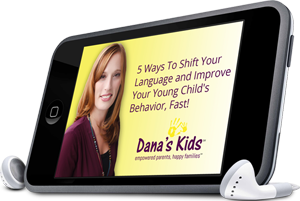 Dana’s Kids workshops provide effective, practical, and thoughtful techniques and guidance that are developmentally appropriate and take into account individual parenting goals. I’ve been in both the position of leader and that of participant in workshops and classes. I’ve watched as colleagues, staff members, and parents have been invigorated and inspired by a presenter, and when the message has fallen flat. I believe that the information we offer educators and parents should be robust, the forum dynamic, and the techniques realistic and action-oriented. The same should be true when we work with young children. Dana’s Kids provides outstanding professional development that will keep your staff engaged and asking questions during meetings. Staff members have the opportunity to customize developmentally appropriate, thoughtful practices to their own strengths. Each and every day I am inspired by the families and children with whom I work. I’d love to share that with your program.